A former South Korean president who was impeached in 2016, Park Geun-hye, has been sentenced to 24 years in jail with a fine of ₩18 billion ($17 million). A court found Park guilty of bribery in a scandal that exposed webs of corruption between political leaders and the country’s conglomerates. Park was convicted of collecting or demanding a total of nearly $22 million in bribes from three of South Korea’s top business conglomerates, including Samsung, Lotte and SK. Separately, she was found guilty of coercing the three companies, and 15 other businesses into making donations worth $72 million to two foundations controlled by Choi Soon-sil, a longtime friend and confidant. Prosecutors initially sought a 30-year sentence and a ₩118.5 billion ($112 million) fine for Park, after indicting her on charges that included bribery, abuse of power and coercion. Park’s conviction on bribery, coercion, abuse of power and other charges was the first lower-court ruling on a criminal case to be broadcast live in South Korea. 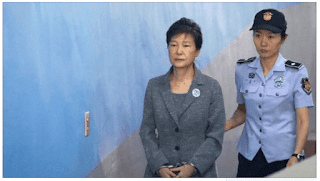 Although Park is expected to appeal her prison term, the sentencing is likely to bring a sense of closure to the corruption scandal that engulfed her. Her supporters, mostly elderly South Koreans, have insisted on her innocence, holding weekend marches in downtown Seoul and shouting for her release. Following weeks of huge demonstrations calling for her ouster, the national assembly impeached Park in December 2016 on charges of bribery and abuse of presidential power. In March 2017, the constitutional court upheld the assembly’s decision, making Park the first South Korean leader to be removed from office through parliamentary impeachment. She was arrested three weeks later.